Fall in love here. 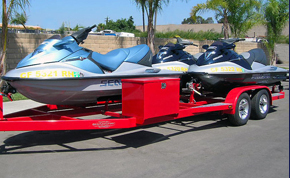 The SHAD 3 LX watercraft trailer is specifically and thoughtfully designed to haul three large personal watercraft. The SHAD 3 LX comes standard with tandem 3700 lb axles, disc brakes, 14 inch radial tires and classic aluminum modular wheels. Dare to compare the sleek design, and tough construction. 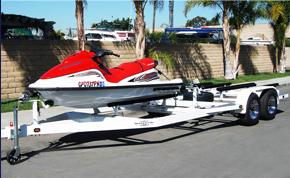 More standard features include the top of the line, Fulton F2 1600 lb aluminum trailer jack, double up front safety cables, large front and rear diamond plate steps, and high gloss powder coat finish. 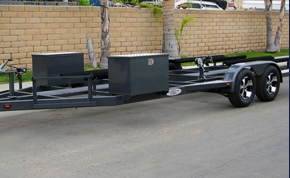 It's easy enough to see, the Shadow trailer is engineered to tow like a dream – and designed to make your life easy. SHAD 3 LX 7000 lbs. 102" 27' 5000 lbs. 14" 2"